Chances are if you're reading this, you're a project manager or interested in becoming one. So, just for you, we have created a quick, handy, up-to-date list of "must-haves" for all project managers—aspiring, novices and experienced alike. Pin it to your cork board, hang it on the fridge and send it to your colleagues. Either way, use it as both a reference and reminder of how you can be on your project management "A-game." The ability to communicate comfortably with people at all levels of the organization is almost always named as one of the top-tier skills by project managers and team members; however, it is important to tailor your message to the audience to ensure the right level of communication. Each person will need to be engaged differently. One may need details while another prefers a brief overview. If someone wants to discuss her daughter's preschool graduation before discussing any business, pay attention. You might even note it and ask her later if her daughter is enjoying kindergarten. Simple things like that make an impact! A project manager can be skilled at putting the project together, but may fail in presenting the information to stakeholders in an understandable and engaging format; therefore, project managers need effective presentation skills—both formal and informal — to gain the positive engagement of ALL the people impacted by their project. This may sound easy, but good presenters typically are not born. You may need to invest in presentation training, practice, and get feedback. Sure, there are some personality trends, but the simple truth is that good presenters have had lots of practice doing it and have been trained to present well. 3. Use templates to help complete your documentation and keep consistency—but remember, templates are a guide, not a rulebook! Templates are great because they give you the freedom from the waste of reinventing the wheel over and over again. But, don’t let them take over your processes and halt your creativity. Treat your projects as a roadmap, and don't be afraid to explore some back roads on your own. Who knows? You may discover a better, faster, cleaner way of doing things — all on your own! Inevitably, your project sponsor is going to ask you the typical questions, "About how far along are you with your project? Are you on schedule? And are you within budget?" You may have a general idea, but how can you be more certain? If you have a system such as EVMS put in place, you will be able to report on the project status with more confidence and therefore earn more credibility among your team members and stakeholders. But remember, if you don't fully understand the metrics, neither will they, so make sure you are "up-to-speed" on how to obtain the data so you can convey the information effectively. Some people have a knack for this; others have to work at it. It's all about getting to know people, their niches, and tapping into your networks for knowledge and experience. This takes a lot of hard work and putting your best face forward—even when you don't feel like it. It also involves connecting and conversing with people on a daily basis. Once you build the rapport and trust that is the foundation of any relationship, people will want to collaborate with you to get the project done on time and within budget. It is imperative to communicate with your stakeholders early on in the project and often. This not only builds trust but you may also gain valuable insights about how you can increase the likelihood of success for your project; however, remember to be flexible about your methods of communication. Some people are more at ease in person, some over email or on the phone, and others one-on-one or in big groups. You'll find that the more comfortable people feel, the more they will be willing to cooperate with you to get the job done. A problem may be the difference between your current state and your goal state, but it is also an opportunity for improvement. Be confident in your abilities to brainstorm and implement solutions. After all, a problem can be a real break, the stroke of luck, a chance to get out of the rut of the everyday and make yourself or some situation better. Note that problems need not arrive as a result of external factors or bad events. Any new awareness you have that allows you to see possibilities for improvement brings a "problem" for you to solve. Having a narrow technical focus is not enough to be a successful project manager; you also need to possess other critical skills such as communication (both written and verbal), negotiation and decision-making to help you do your job more effectively. Skills such as these are imperative — for example, when you cross organizational boundaries to obtain support or get decisions formed and implemented — but tapping into these skills may not come naturally to you. Read books, take courses, listen to webinars/podcasts, and utilize the web to tap into blogs, articles, and whitepapers. As you do this, pick out something new each day to apply on the job and in your day-to-day activities. Before you know it, this process of continuous improvement will soon accumulate, and the skills you were previously lacking will become second nature. 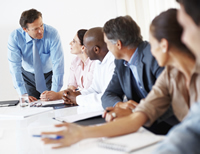 Your first project meeting is an opportunity to share your plan for leading the project to a successful completion. You should take advantage of this one-time chance to energize the group, set proper expectations, and establish guidelines that will help you complete the project on time and within budget. Stay on track (this is not the time for you to give your colleagues a "play-by-play" of your son's weekend soccer tournament). Following the meeting, email everyone the key takeaways and decisions to avoid possible misunderstandings. A proactive project manager tries to resolve potential problems before they happen by developing a risk management plan. Yet, not all issues can be foreseen and the unlikely can occur — so don't be afraid of what might go wrong! Some things are simply out of your control, and you will inevitably make mistakes in your career. The key is to learn from your mistakes by understanding what didn't work and how you can improve upon it the next time around. Everyone likes to feel important, valued, and appreciated. Often, projects get so involved that we forget about the little things such as a "job well done" or a pat on the back. If you make it a priority to give sincere praise on a regular basis, you will have well-motivated and highly effective team members. As project managers, time management probably comes naturally. But, what do you do when your resources have been cut and you've got twice as much to do? To really "do more with less," you've got to become more productive. So, why not make it a necessary part of each day to plan the next day? Keep your "to-do" list wherever you want, but make it work for you, whether it's on your computer, phone, or good old fashioned notebook — something as simple as this can help you identify top priorities, eliminate time-wasters, and get rid of wasteful processes. You can't do it all yourself. Delegating not only provides team members with opportunities to hone their skills but it also shows that you trust them to get the job done — no one likes being micromanaged! But as a side note, remember that YOU are accountable for the project, and regularly checking in with your team members is a smart way to ensure completion of all delegated tasks. A great way to ensure best practices are captured is to commit your thoughts to paper and share it with others. Find a way to keep track of best practices for each project that works for you, whether it's filed on your computer, on a network drive, or in file folders. This is a powerful way to ensure your hard work doesn't go unnoticed, while creating a permanent record that you or someone else can reference in the future. Ensure that all your projects run smoothly and productively by putting in place, documenting and following processes. Yes, implementing a new system is time-consuming. Think about a home project you have done in the past, such as cleaning out your closet. It probably took a while to get where you wanted with it, but now that it's clean, and maintaining the cleanliness only takes minutes a day. Doing work right the first time may take more time up front, but time spent making corrections takes even more time overall! Decision-making is an integral part of project management. Yes, it is important to get the right people involved and get their opinions; however, you should always make the decision that is best for the project and the organization overall — even if it is not the most popular one. It is unrealistic for any project manager to expect 100 percent consensus. Learn to thrive on the tensions between your own voice and the voice of the people and you will be better off. Keep you up-to-date on issues and developments. Let you see who the "thought leaders" are. Provide information about upcoming conferences, networking opportunities and professional development opportunities. Allow access to journals, job listings, newsletters, articles, blogs, and much, much more! People need time to celebrate and relish in the successes of the project. As well, if the project did not go smoothly, it is important to capture the lessons learned and give the team a chance to let go of the past so they can move on to future work. Working on projects is often hard work, requiring many hours of dedication. This is why it is important to recognize team contributions to making any project a success. This may be done with the team at a celebration ceremony or with individual members being rewarded for each of their contributions.